Fly fishing and weir fishing (Yana) for Ayu is a popular summer pastime in Japan and a good example of a Japanese traditional fishing method. The Ayu fish (a small Japanese river trout) is a unique genus. Ayu fish are amongst the Japanese people's favorite fish. The fish have a sleek body and when broiled with salt are tastier than many other species. To Japanese people, the word Ayu conjurs up images of summer, the countryside, and good taste. Most people who catch Ayu do so at a Yana. A Yana is a small weir made of wood and stone, with a fish trap (a type of fishing net) attached to it that is made of bamboo, reeds or other suitable materials. 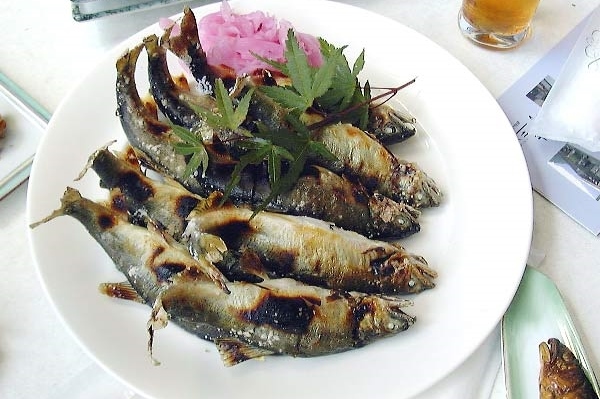 The opening of the fishing season is good for a barbecue of freshly grilled Ayu with salt and miso (bean paste) and cold beer. 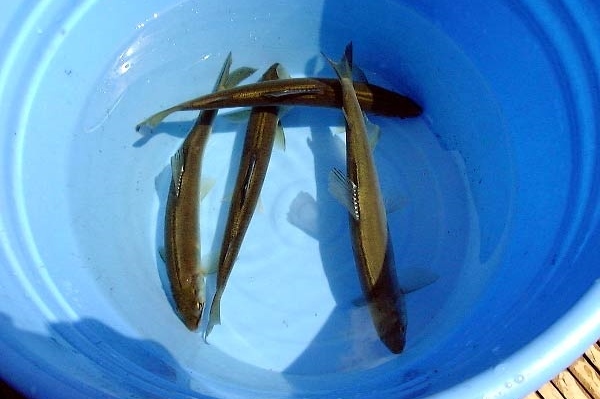 The origins of yana are unknown, though the Ainu (Japan's indigenous people) and the Japanese have long raised these fish and harvested annual catches. This fishing technique is not restricted to Japan, and was widely practised across the Eurasian continent wherever the environment suited. The Ayu eat organic plants attached to pebbles or rocks on the river bed. Ayu are very territorial, and each fish tries to maintain a territory of about 10 to 20 square meters (approx 105 to 210 square feet). They will attack any other fish that enter their territory. An experienced angler takes this behavior into consideration and uses other Ayu as bait ("invaders"). The trick is to attach 3 to 4 hooks to the underside of a baited Ayu, using the gills to secure the line. The fish is still alive and able to swim, though weakened. The angler then looks for an Ayu grazing in the waterweeds. Japanese streams are usually not very deep, and an Ayu will usually forage in the shallower areas or slower flowing parts of a stream away from the thalweg (the thalweg is the deepest and therefore fastest flowing part of the stream as a result of the "pool and riffle" sequence) as there will be more organic matter available to eat. The next step is to guide the bait (invader) fish using a very long rod into the territory of the Ayu. The Ayu will naturally regard the bait as an invader of its territory (especially if another Ayu is used as bait). Initially the Ayu will keep an eye on the bait fish to see if it will respect its territory (ie swim away once it realizes that this part of the stream is "taken"). As the invader will of course not leave the territory (because the angler will keep it in there using the rod) the Ayu will attack in an effort to drive the invader off and so protect his feeding area. The attacks involve charging and ramming the belly of the bait fish. Since the bait fish is alive and struggling but unable to leave the territory (due to the rod), it is usually only a matter of time before the Ayu is hooked. Why??? Because the bait fish will repeatedly try to escape the attacker (and in doing so pull the hooks along beneath). The fish that has just been caught is usually hooked on the shoulder (and so not badly hurt), but to prevent further injury you shouldn't reel them in - use a net and bucket. After retrieving both fish from the stream, the next step is to switch the exhausted bait fish for the newly caught Ayu. This then becomes the new bait/invader fish - this is the unique aspect of Ayu fishing. The process is then repeated, each time with the newly caught fish replacing the exhausted invader. Being Japan, and since the Ayu season is summer, the sociable thing to do next is have a barbecue. As with fish caught at a "Yana", you skewer the fish through the mouth with a sharp kebab-stick. Once grilled, salt lightly and start eating. Best accompanied by a selection of sashimi, salads and icy cold beer.